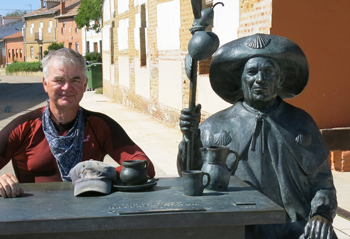 John poses along the Camino with a bronze friend. 1. How many years at OLMC? I’ve been with Mt. Carmel for 26 years. The Way with Martin Sheen and directed by his son, Emilio Estevez. 3. A fun/moving/exciting OLMC memory? Watching each of my children receive the sacraments of Baptism, First Communion and Confirmation; starting CLOW with Angie Bracconeri and seeing it sustained; and OLMC Track. 4. Last book you finished? Jesus: A Pilgrimage by James Martin, S.J. 5. A place you always wanted to travel to? 6. Life advice? Favorite quote? “I may be tired of walking but I am not tired of sharing.” – An Australian pilgrim on the Camino de Santiago.